While an ongoing New York City police mission to get handguns and other weapons off the streets is valid, we have represented many clients arrested on weapons charges whose rights were violated — and others who had no criminal intent or did not even realize what they carried was illegal. Please contact our midtown Manhattan-based law firm if you have been charged with a weapons offense. We are ready to help you fully understand possible consequences and build the best possible defense in your case. Unquestionably, if you have been arrested for a violent crime involving a handgun or other weapon, your freedom and future may depend on the skill of your defense lawyer. Our attorneys have obtained acquittals, dismissals, and reduced charges for numerous clients facing felony charges, including assault and homicide. In many such cases, several charges may be filed against you — including criminal use of a firearm which, in itself, can carry penalties up to a 25-year prison sentence. Many gun charges and other weapons cases turn on the legality of the search — whether of your vehicle, home or person. Knowledge of this legal area is a clear strength for both our attorneys. In fact, while he was First Deputy Bureau Chief at the Kings County D.A.’s Office, virtually all search warrants in Brooklyn for guns and drugs required Jay K. Goldberg’s approval before being presented to a judge. Our track record also demonstrates our ability to attack police testimony — often winning acquittals at trial or other positive results. 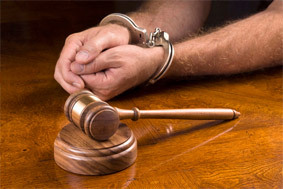 We encourage you to call or email us for a consultation if you have been charged with a weapons offense.